Happy Sunday! I hope you’ve been enjoying your weekend. I’m just here patiently waiting for it to get at least a little bit cold. Today I’m sharing this casual fall look with UGG. I’ve worn UGG boots ever since I can remember. When I was younger and it dropped to the 70s here in Miami, I would instantly throw on my UGG boots because that was the only time we could wear them! My style for fall is really casual, comfortable and neutral (can you tell?). 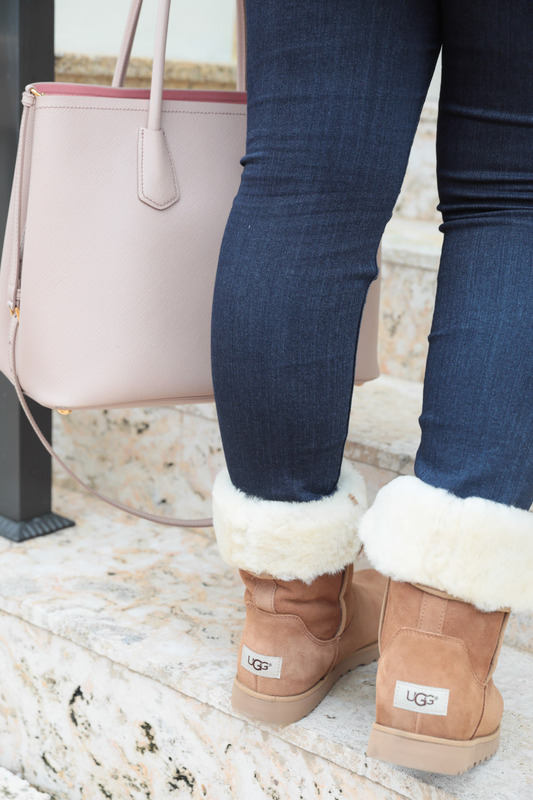 I love these UGG boots because they match with all of my outfits, are water resistant and SO cozy! I also lounge around my house in these because it’s basically like walking on clouds. I know that as soon as I move to NYC I’ll be wearing these even more because they’re so practical for everyday. I also love wearing my UGG boots with leggings and an oversized sweater to run errands. I know a lot of people have claimed that UGG has gone out of style but I honestly don’t think comfort will ever go out of style (I mean, did you see that the Juicy tracksuit is back?!). These boots are perfect for those chilly fall days where you just want to hang out, be comfortable and feel good. Plus, the new arrivals are so amazing. They even have this scarf, which is such a pretty color and probably so comfortable. For this outfit, I wore my favorite cardigan that has been on heavy rotation this fall. I also recently purchased my first Charlotte Tilbury lipstick and I love it! They have great shades for every season and the formula is pretty moisturizing for a lipstick. What do you guys like to wear for fall? Do you have a pair of UGG boots? Thank you to UGG and Her Campus Media for sponsoring this post. As always, all opinions and writing are my own.